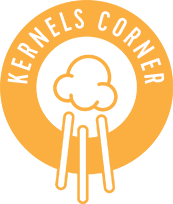 By Kernels Popcorn | Nov, 2015 | Tagged " Kernels Corner "
The English word "angel" comes from the Greek angelos, which means 'messenger'.The word “angel” has come to represent someone of extraordinary goodness, as in: he or she, “is an angel”. With the holiday season here, it is very easy to get caught up in the hustle and bustle of our own lives including buying presents, entertaining, travelling, and generally over indulging!! Yet the holiday season can also be a time for reflection and doing meaningful things for others who in many cases are not as fortunate as ourselves. “Gratitude” and “attitude” are two words that remind us that with all of life’s difficulties, we need to be thankful for what we have, and stay positive amid life’s challenges. With gratitude and attitude also comes the capacity to do good; to, “do that angel thing” for others, whether we are at work or at play. I am writing to let you know about one of the employees at your Bower Mall Red Deer Location. On Sunday Nov. 22 Bower Mall hosted its annual Red and White shopping event from 5:30 to 9pm. There was an estimated 4000 people enjoying after hours shopping. During this time there was only one staff member at your Kernels location in the mall. I do not know her name unfortunately but she was amazing! All night I saw that she was lined up and very overwhelmed. She looked tired and exhausted and even like she had a head ache, but she smiled at every customer! She was patient and helpful and even went out of her way to make me special popcorn. I felt so extremely bad for her and so did all my staff (I work in the mall). It was not right that she was alone all night. She never got a break even to go to the bathroom. At the end of the night I went over and gave her a flower, and told her how amazing she was. She was so shocked that someone would do that for her that she started to cry. I must say she is a very, very hard worker and you are lucky to have her. She is a gem! Both Natalie, our Kernels Angel, and Cheryl, our Customer Angel, should be recognized for their outstanding efforts. 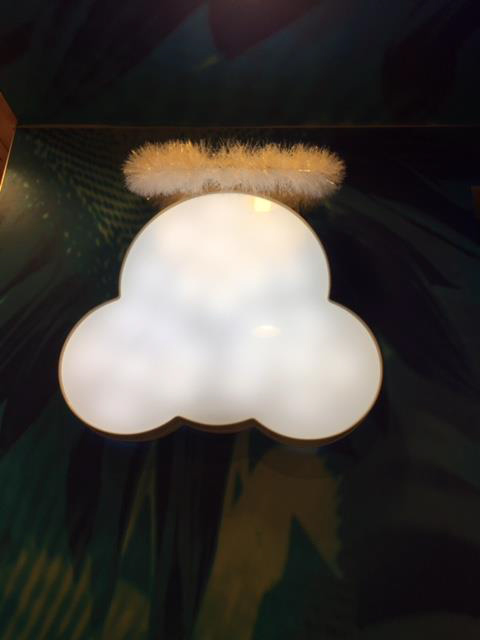 Halo’s to both of you! 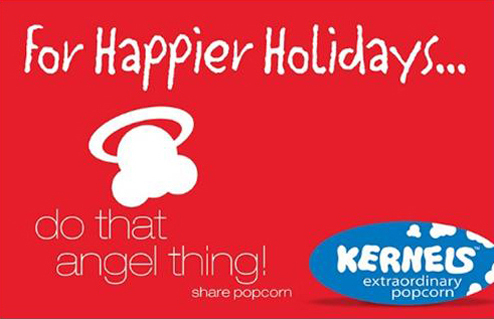 Here’s another clever Kernels Angel – Joy from Fairview Mall sent us her Kernels Angel Logo Thanks Joy for being a creative Angel!…. OK, that one made me laugh! My Mom never called me her little angel- so this is a first! Happy Holidays to you and your families, and to doing that angel thing!! The Optimism Fever, have you caught it yet! Live from Toronto, it's Live Chat for Kernels Customers! What do they Love about US?